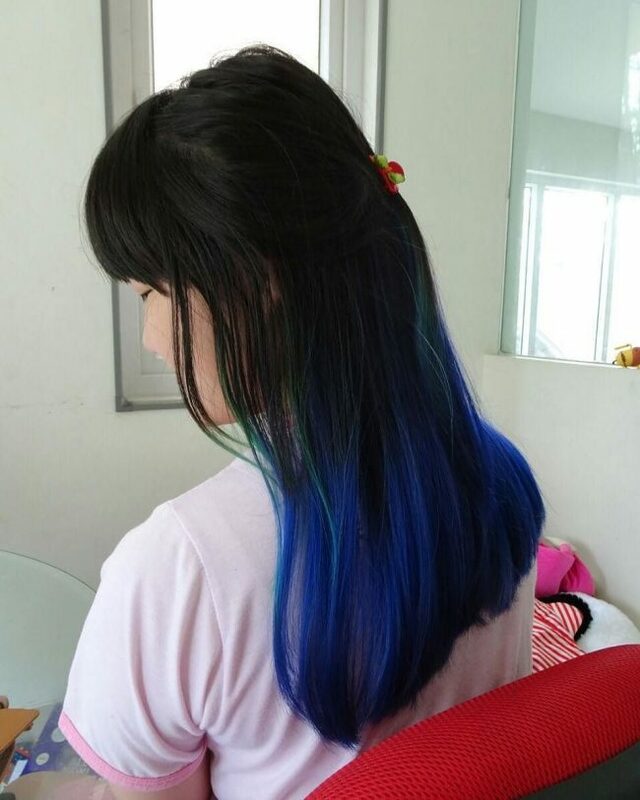 Blue ombre hair reminds us of fantasy beings such as fairies and mermaids and so you can be sure that it will always make you look stylish. And so if you are thinking of changing your hair or just what to wear a fun style then you should try this trendy pattern. 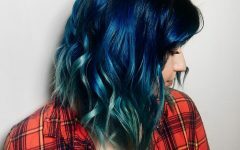 It is also not as difficult to achieve as it looks because all that you need is a skilled stylist and a shade of blue that you like. The options are endless when it comes to this color design and below are 40 color patterns that will offer you some inspiration on what you should try. A long mane like this one would look good in any color, but the dazzling light brown to blue pattern gives it some class and takes its appearance a notch higher. 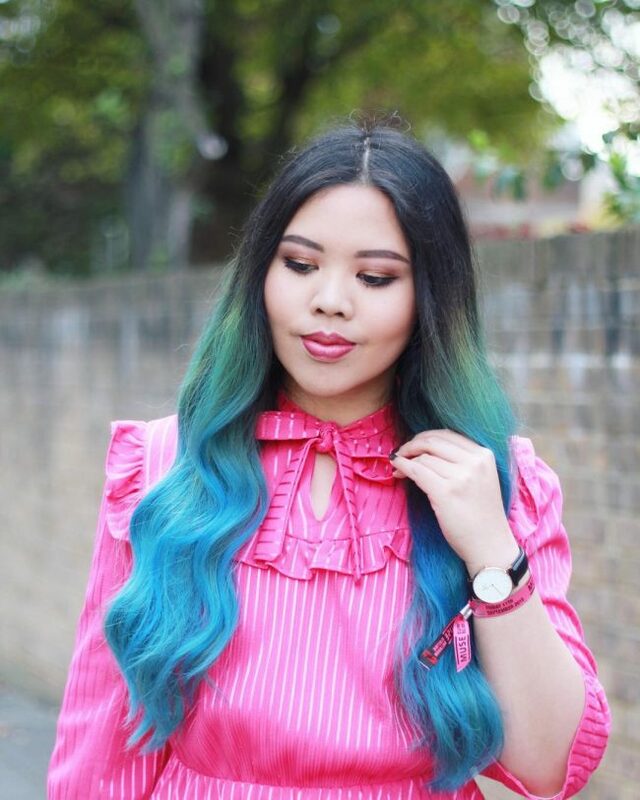 Apart from the pattern that the shades create and their shine the long locks also have an amazing style that involves weaving the strands into a massive French fishtail braid. 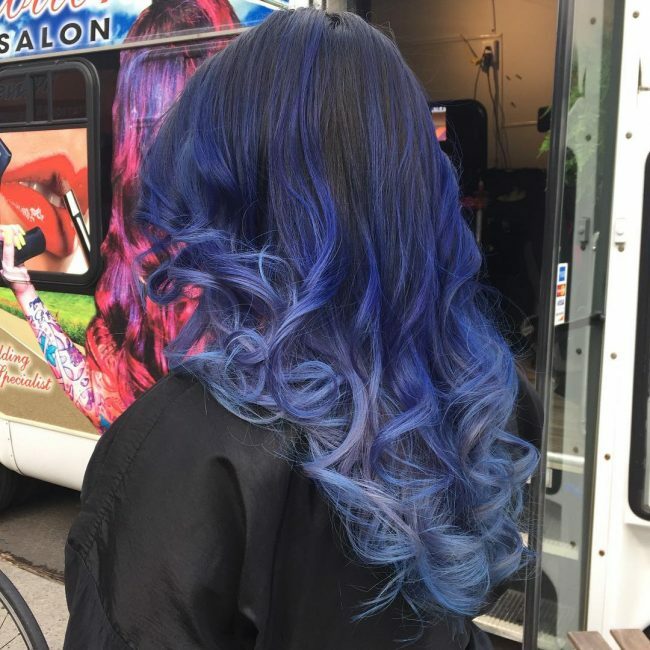 You can also use more than two shades to create a fantastic blue ombre design, but you have to choose your shades and use them well. 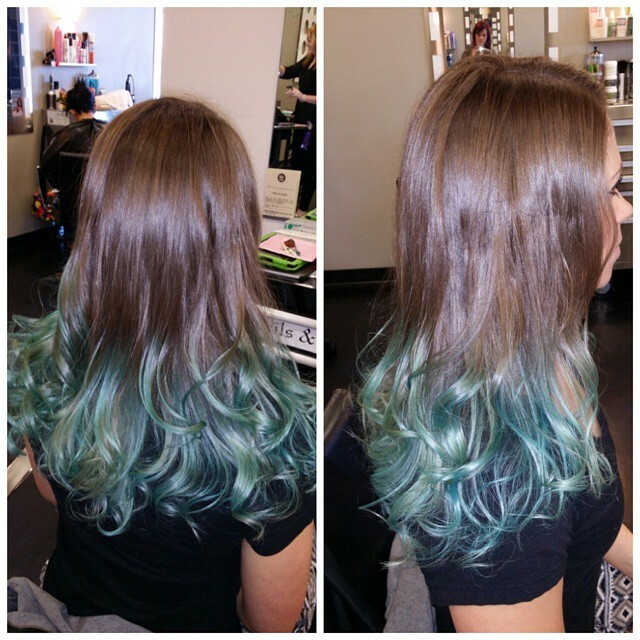 This design uses a golden shade with light green and blue to create an amazing dye job. The design starts with the golden hue then transitions to the light green before finishing with the magical blue hue on the tips. These long strands also have some subtle curls and slight layering that help to enhance the appearance. 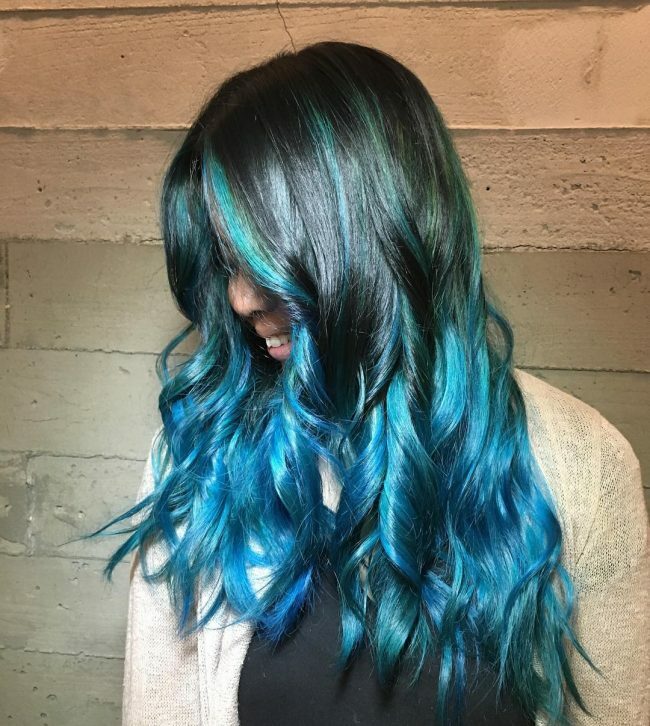 Mermaid hair is typically bright, but you can still create it with some dark shades like in this design. 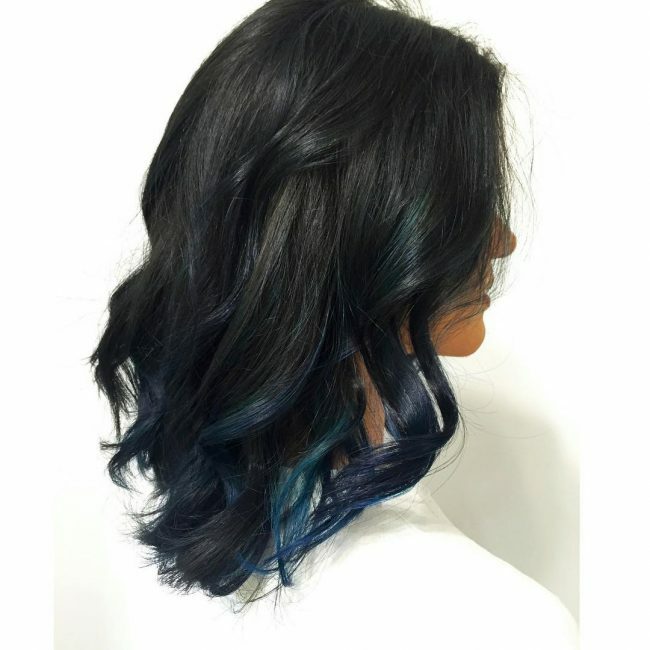 This style uses dark brown and blue to create a fantastic ombre pattern that makes the long locks look magnificent. And for styling you should push the locks back and stack them slightly. 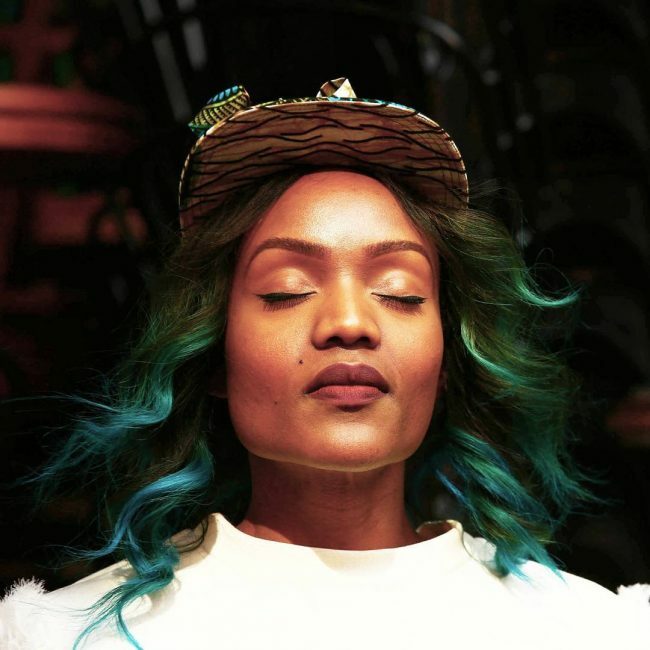 This style shows how you can transform your natural black locks into a splendid headdress without having to do much. 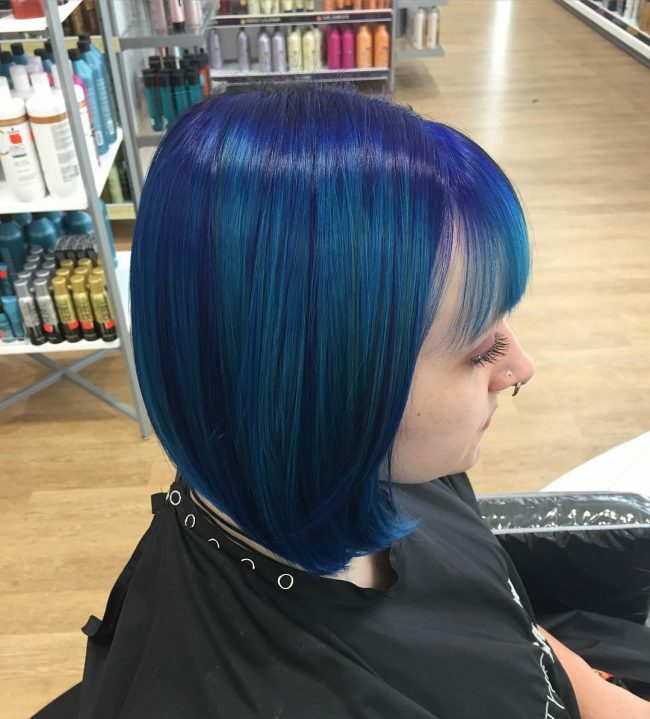 All you have to do in this design is to give it a bright blue shade on the lower half to create a vibrant blue ombre hair pattern. And to style the strands you should clip a few of them at the center of the head to create a half updo design. 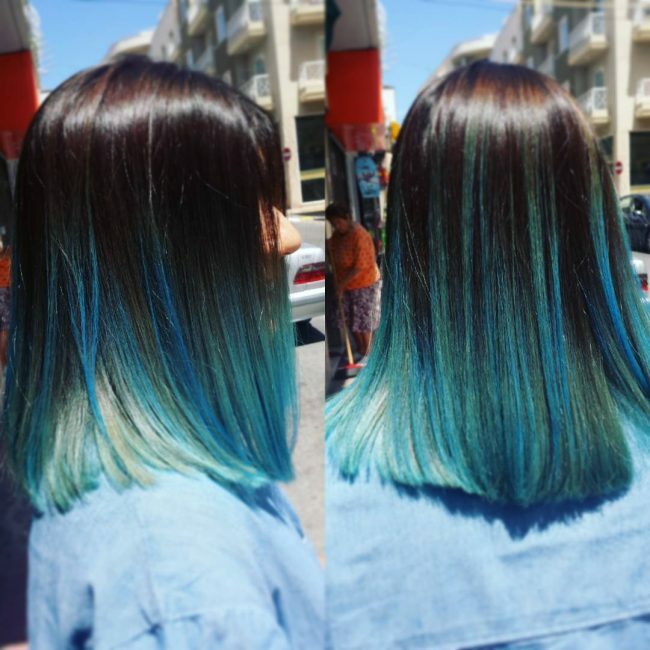 Your haircut and how you use colors are as important as choosing the right shades. In this particular hairstyle, the long wavy locks have a fantastic cut that creates some lovely bangs and a fringe. However, the hand painted transition from the dark brown base to the bright color on the ends is still what makes this headdress stand out. 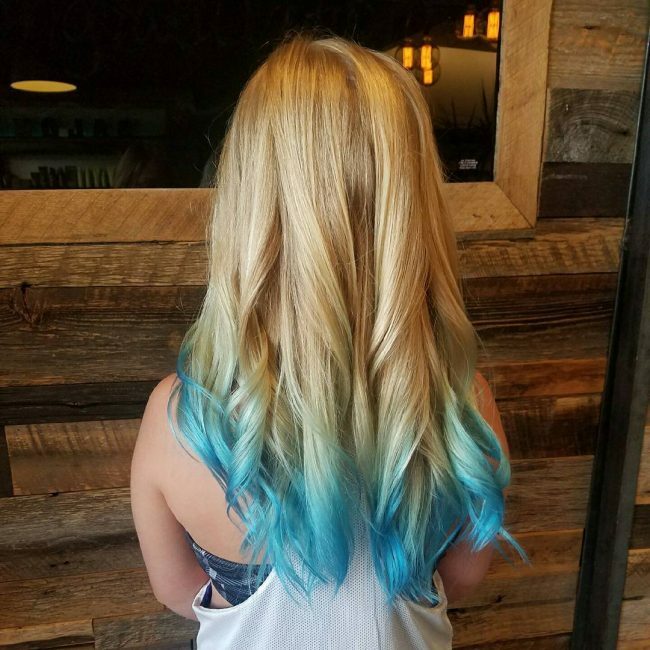 This cute mermaid hair has an incredible choice of colors, and this is what makes it a top notch hairstyle. 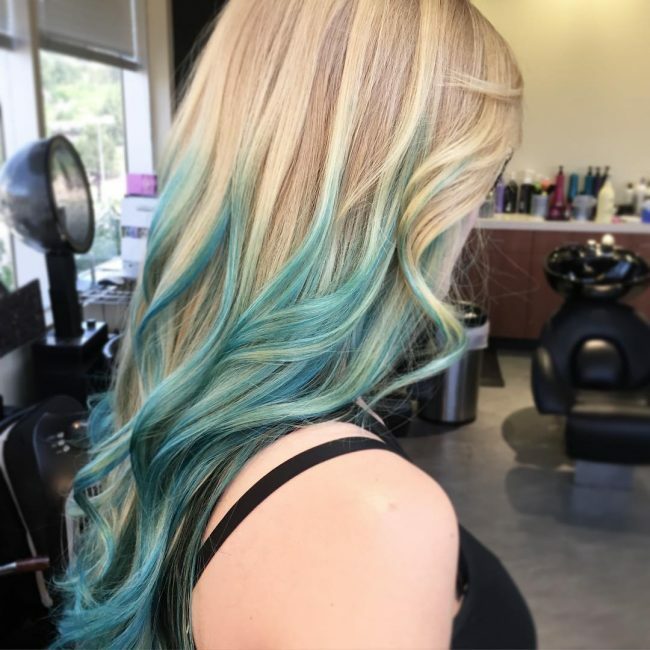 The design has a blonde shade as the dominant hue in the design, but it transitions to a teal hue on the ends to create a fantastic contrast. These long locks also have an amazing texture and some fabulous waves that help to spice up the look. The shine on these strands is incredible, and it makes them look very healthy. 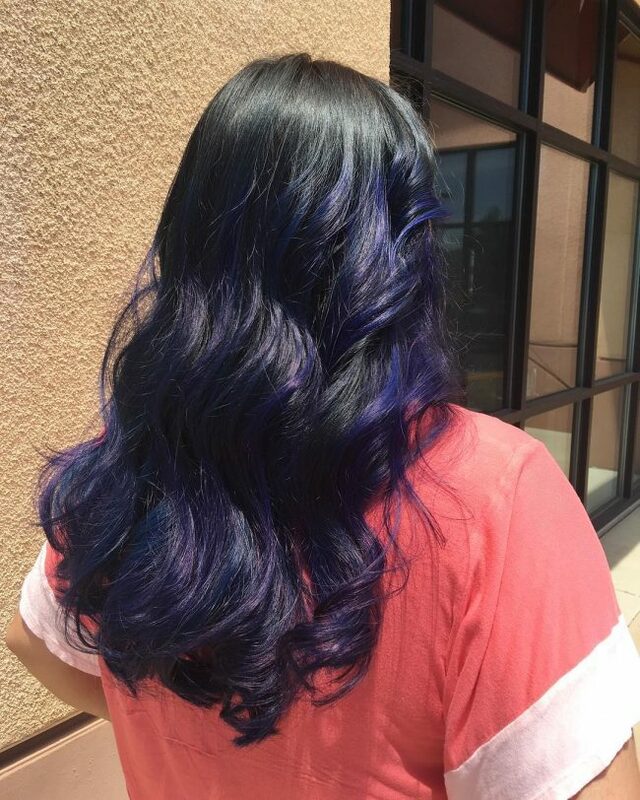 Their beautiful shade comes from blending violet and blue to create an eye-catching tone. You should also make the roots dark so as to create some contrast in the style. The cut is also magnificent, and it involves chopping your strands to create some face-framing bangs and a neat fringe. 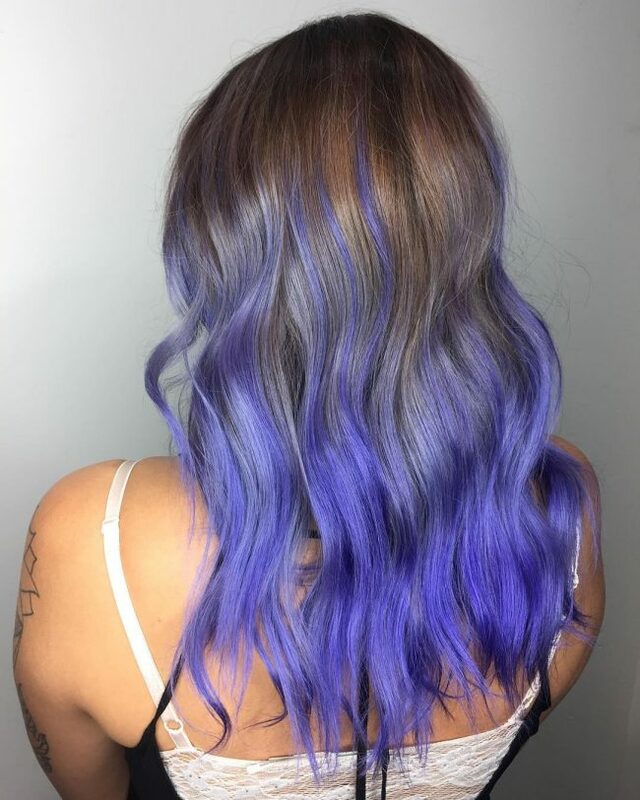 This multi-tonal look comes from introducing blue and purple on some natural honey brown locks. 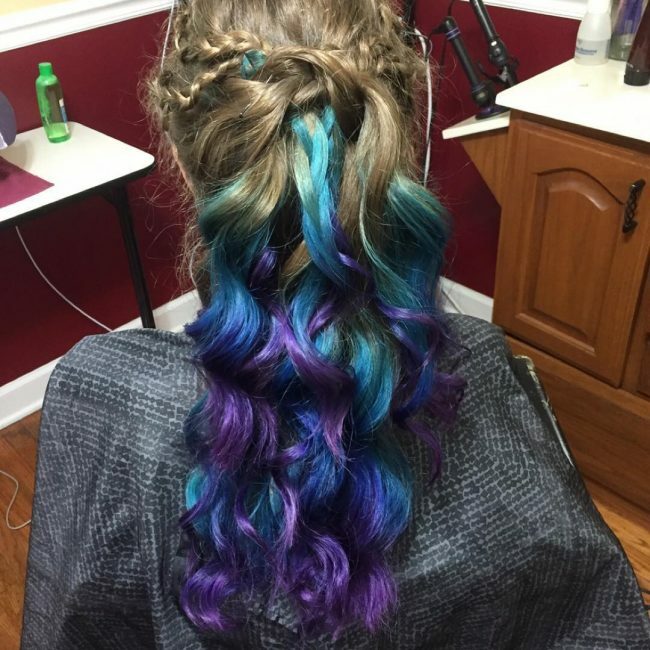 The two shades should be in the lower half of the hair with the purple forming the tips of the hair. And for styling you should weave a couple of braids and then pull everything into a messy twisted ponytail. If you prefer to keep things short, then this hairdo will work for you. 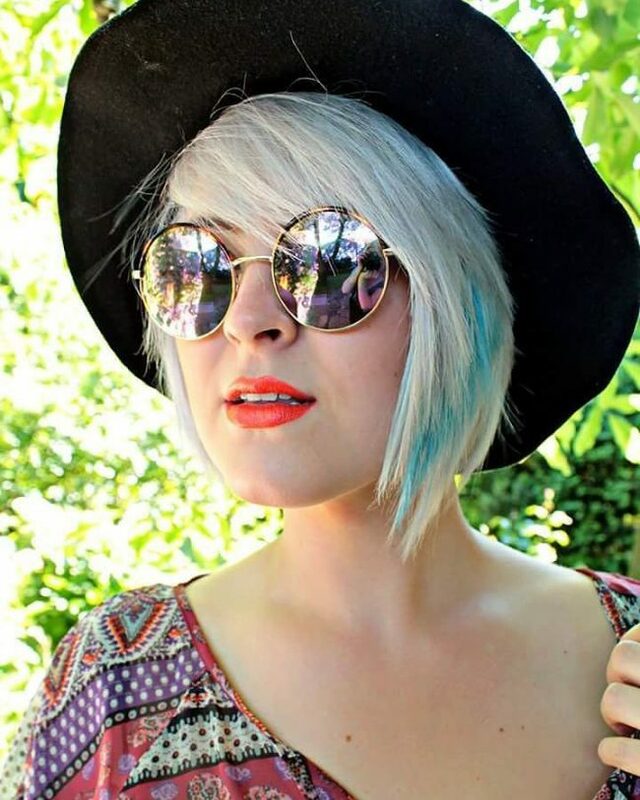 It involves cropping your strands short and then giving them a lovely gray shade with a bright peek-a-boo. You should then finish the look by brushing your cropped strands sideways. A long bob haircut is fabulous, and it will always make a woman look fantastic. And if you give it a lovely color pattern like the black to teal ombre in this design you will look very refined and elegant. To spice up your long bob, you should also make it wavy and style the locks by brushing them back in layers. Some ladies have an amazing natural hair like this one with all the qualities that one can ever wish for in their mane. 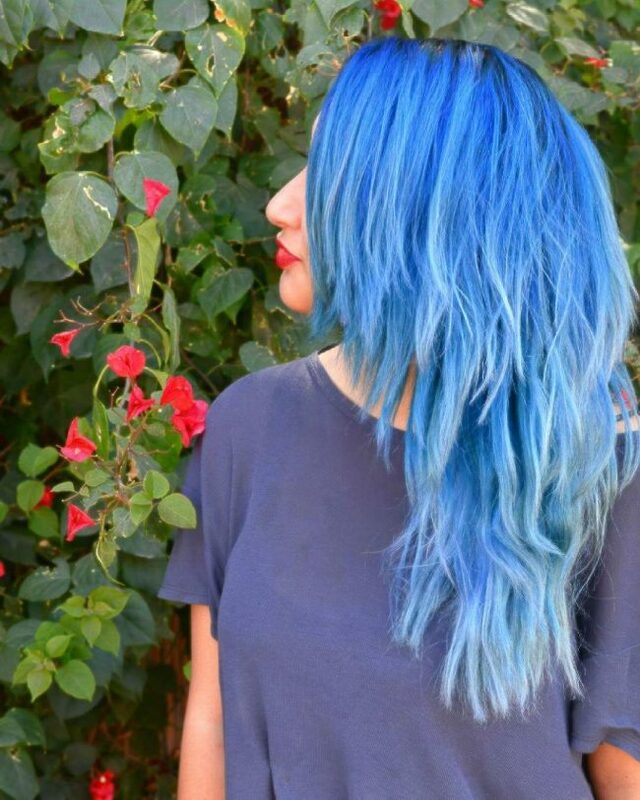 However, even with such a perfect hair you still need some color if you want to look trendy. For this particular headdress, a bright turquoise shade makes all the difference. The roots are also dark, and this helps to give the long curly locks and adorable contrast. 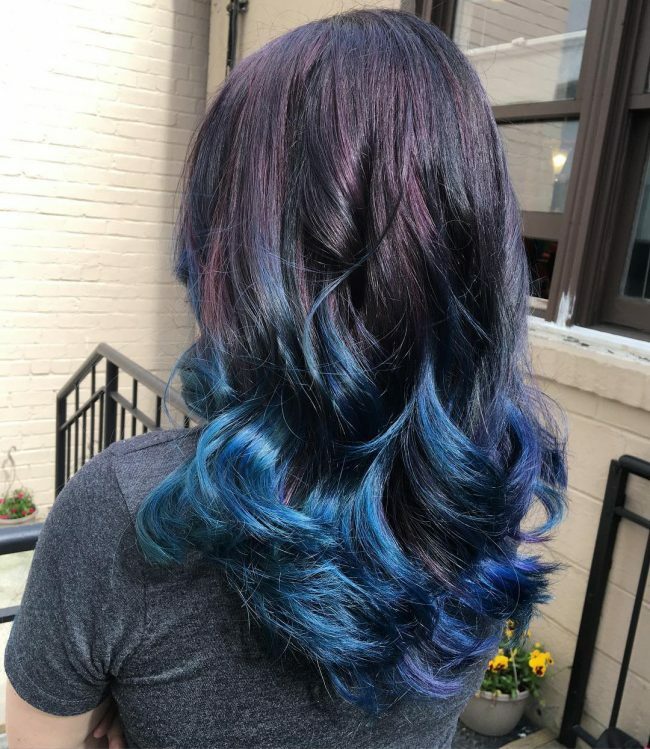 Balayage is the best thing that you can give your hair, and it makes a huge difference in this design. Although the strands are only a couple of inches long, the balayage gives them an incredible color melt that creates a very polished look. These strands also have an excellent shine and for styling, you only need to brush them sideways in layers. Sapphire is an unusual shade, and it makes all the difference in this design. Apart from just giving the strands and incredible shine it also creates a contrast that makes this headdress look very fashionable. The shoulder length strands also have an excellent texture and some swirls on the ends that also enhance the appearance. A Sombre color pattern will also work well for you if you do not prefer a drastic transition between your shades. 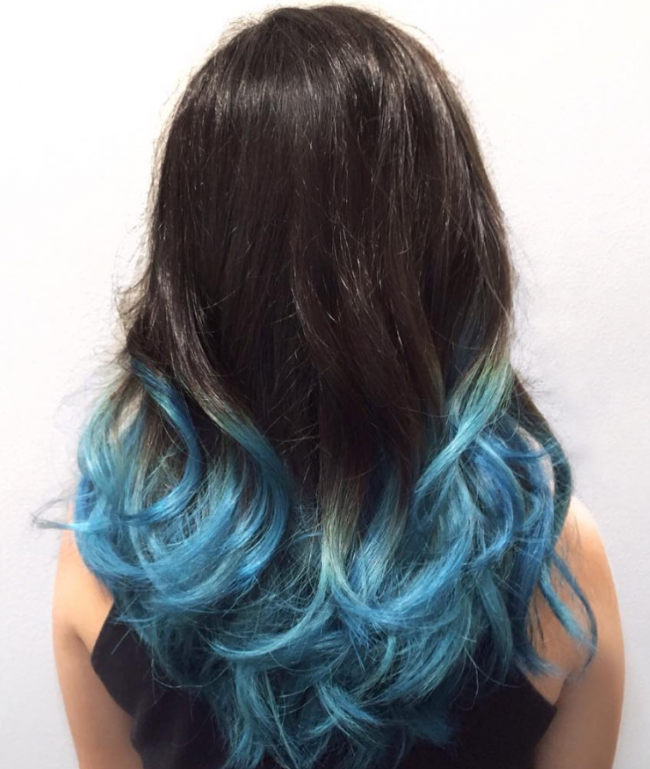 In this style, the blue shade is throughout the head, but it gets brighter towards the ends to create a beautiful soft blue ombre design. The hairs also have some lovely swirls, and you should style them by stacking. Blonde forms a perfect color and you can accentuate it with almost any shade you wish and still look fabulous. 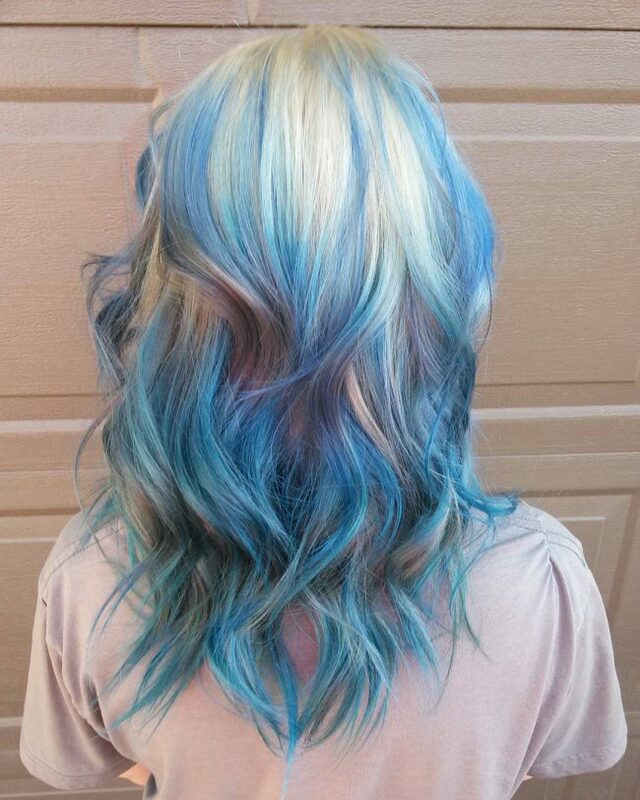 In this design, it has a light blue hue on the lower half of the hair, and this creates and incredible texture. The long locks also have an amazing texture and some lovely waves that make it look splendid. This headdress starts with a neat scissor trim that gives the shoulder-grazing strands a blunt look. 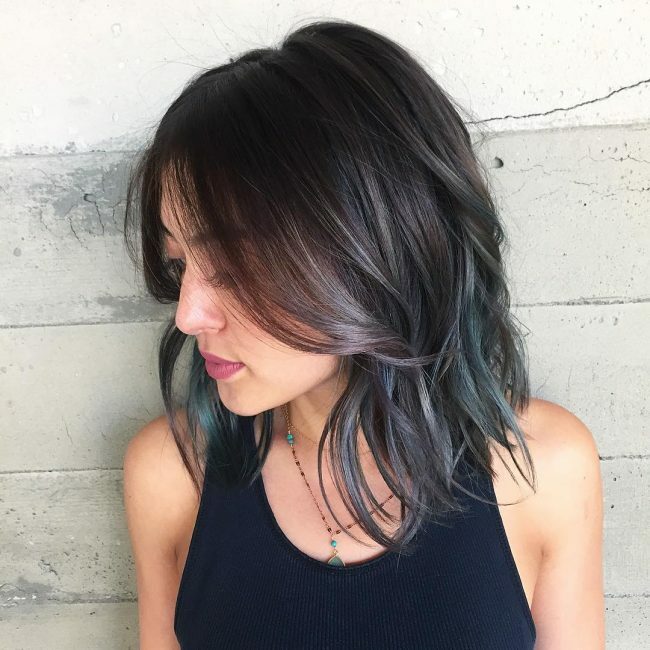 The next and most important step is to give them their distinctive shade and for this you will need to introduce a turquoise shade to the black strands using balayage technique. The black hue should form the base and then transition to the turquoise to create the shiny ombre pattern. You should finish the look by brushing back the strands in layers. It is hard to decide what makes this headdress look magnificent because everything about it is flawless. 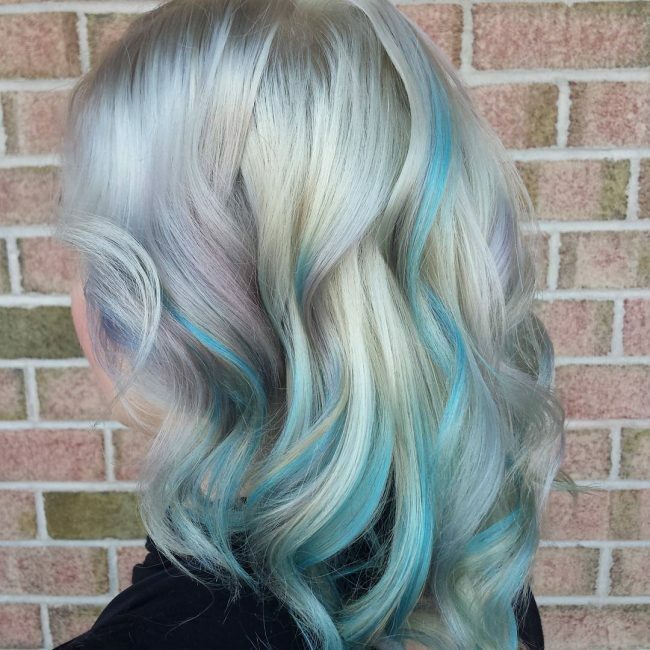 However, the light blue shade is the first thing that you will notice because it gives the natural blonde a trendy look. These long tresses also have some lovely waves, and you should style them with a push back and by giving them a slight mess. Dark tones are perfect for ladies with a light skin tone, but it is vital to choose the right shades. 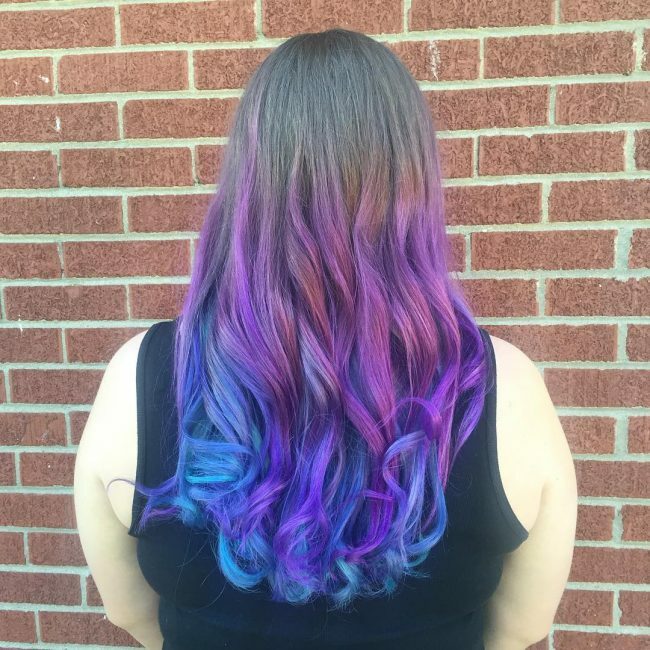 This design has beautiful hues and color pattern that starts with a blend of black and purple before transitioning to the beautiful blue shade to create an ombre pattern. The coils on the lower half of the hair are also magnificent, and they will make this hairstyle look flawless. The diagonal look in this headdress creates a very mysterious and charming look but even with such a perfect style you still need some color. However, the design also has some excellent hues, and they create an ombre pattern that involves transitioning from a dark to pale blue pastel. The waves on the locks and their incredible volume are also vital in creating this hairstyle. Silver is a magnificent shade that will always brighten your strands and make them look very healthy. And if you combine it with a vibrant shade such as the blue pastel on the lower half of this style then you can be sure or a stunning headdress that will always make you stand out. It also helps if you have some voluminous swirly locks like these. This style is ideal for a brave lady that is not afraid to experiment on her hair. 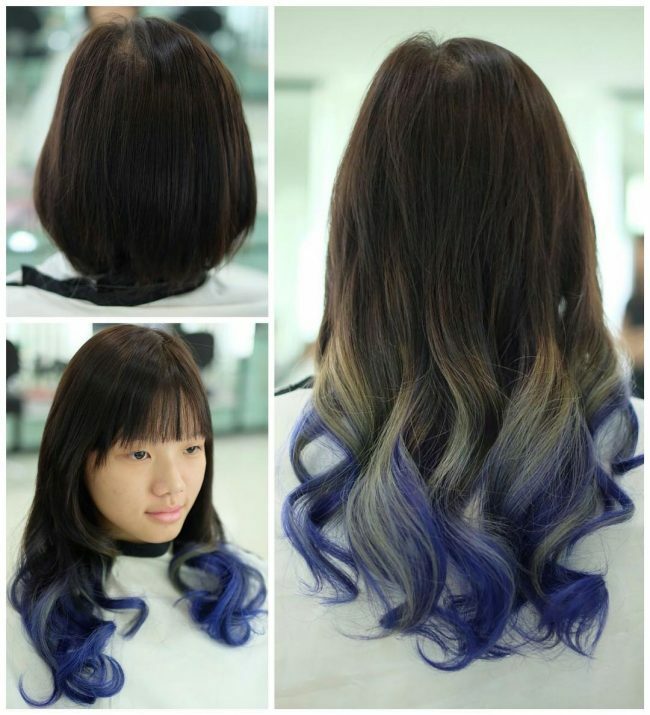 It has a vibrant blue shade throughout but it is darker on the roots than on the tips to create a classy Sombre pattern. The headdress also has a gorgeous undercut on the side with a bright violet shade that helps to create a multidimensional and trendy look. How you cut your hair will determine how attractive your shades will look. 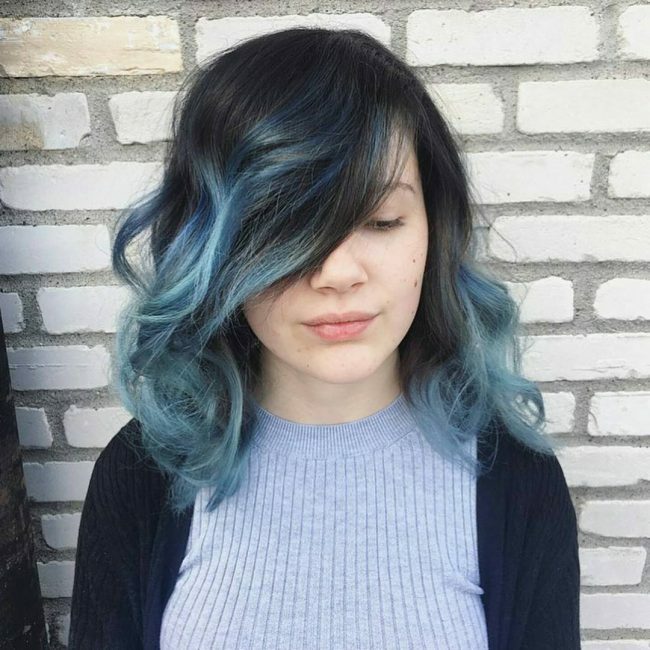 In this design, the long strands have an asymmetrical haircut that creates some excellent bangs that make the lovely blue pastel shade look very detailed. And for styling, you will only need to push your long strands to one side to show off your bright and beautiful color. This headdress is another excellent example of how you can create a majestic look with dark shades. At first glance, you will only notice the violet shade on the design, but there is way much more to it than this. 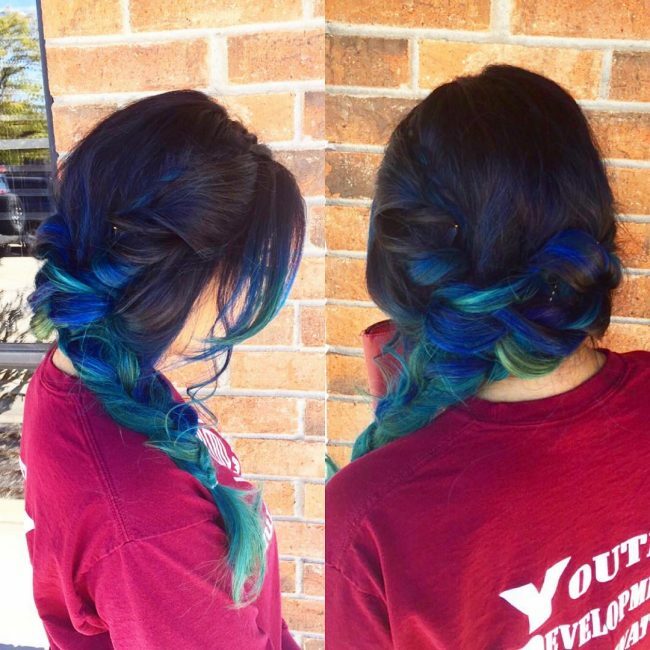 This hairstyle also has a blue hue that gives it some dimension and also creates the highlighted look. The waves on the long locks also make things easy for you as you only need to brush them back to finish the look. Perfect loose curls like these make things easier for you because you do not have to do anything complicated to create a fashionable headdress. 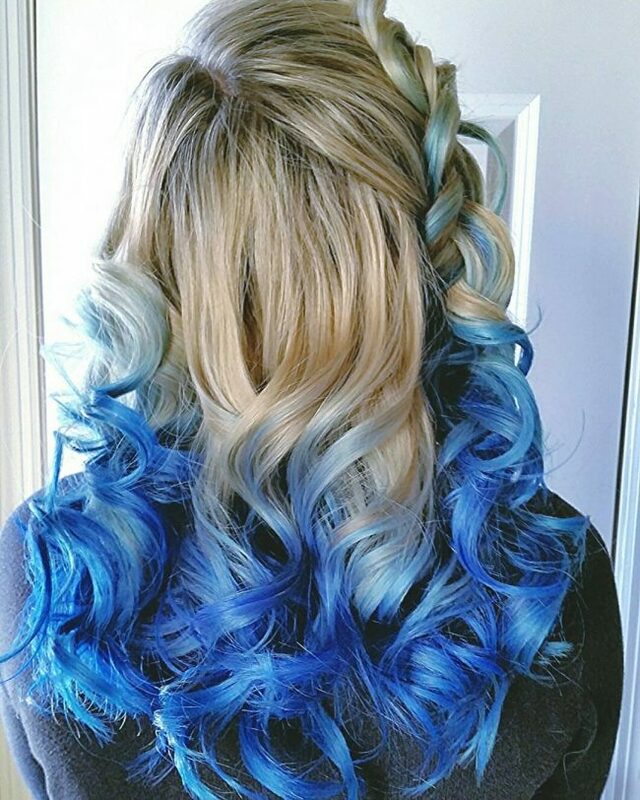 Here the blonde curls will only need a bright blue shade to create an ombre pattern that makes them look adorable. To style them you can create a simple braid on the side and then stack the rest slightly. 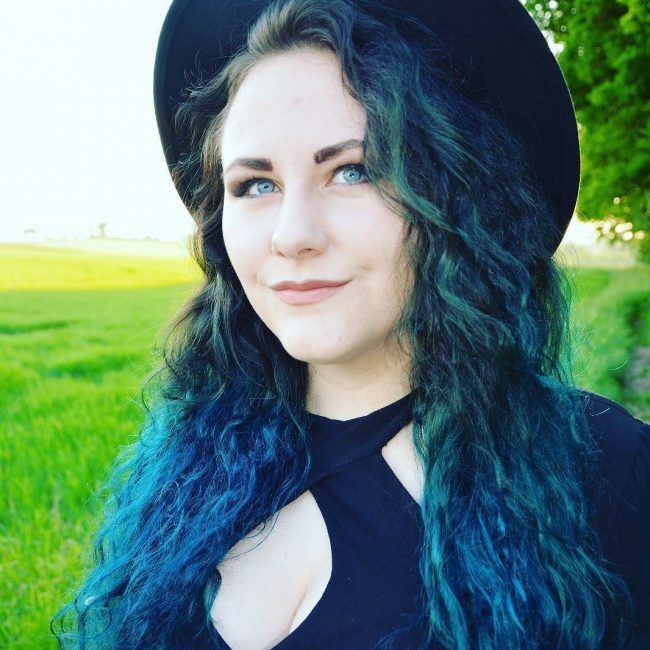 This wavy green mane is perfect for the outdoors and so it will be an ideal summer look. It has some lovely waves and although it is only chin length it still has all the beauty that you can ever want. 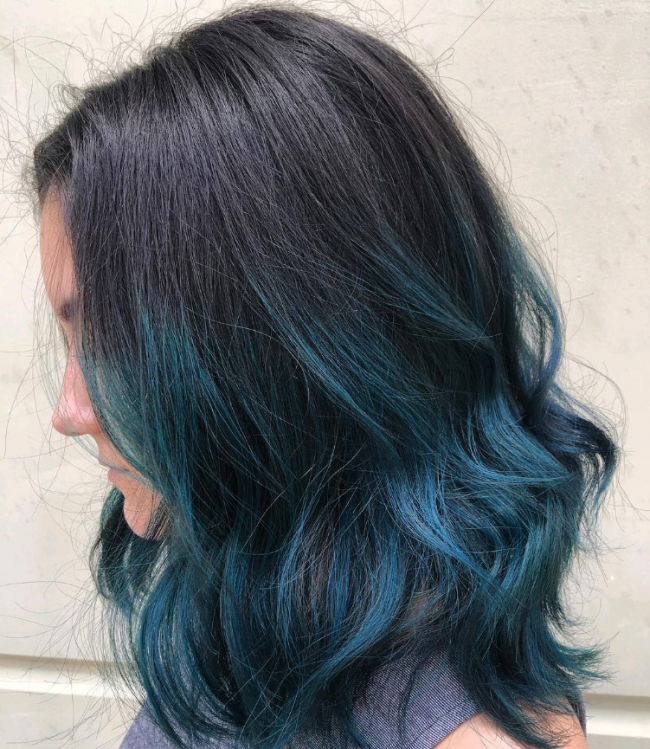 This design is very effortless as you only need to hand-paint a blend of green and blue and then make your roots dark to give the style some contrast. Brightening your dark locks will provide them with a vibrant and healthy look. 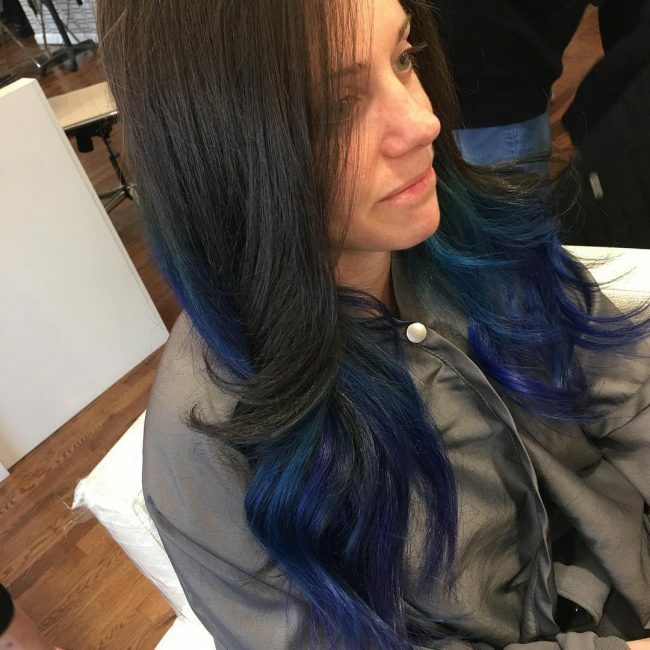 The blue shade in the hairstyle not only creates a perfect ombre pattern but also helps to brighten the natural dark brown strands to make them look healthy. These strands also have some lovely curls, and you should style by pushing them back and layering slightly. The V-shape cut is also beautiful, and it makes the hairdo look trendy. These shoulder-grazing strands have an amazing texture, blunt cut, and some fantastic waves. However, their color pattern is also splendid, and it helps to make them look fashionable. The design involves introducing a teal hue to the natural black shade to create a fabulous contrast. You should them finish the style with a center part and by sweeping the strands into a face frame. Brown is a natural hair color, and so it will always form a perfect base for your shades. In this style, it helps to create a beautiful color pattern that involves transitioning it drastically to a bright pastel shade. These stands also have some subtle curls and a stacked design that makes them look magnificent. A cute messy braid like this one still needs some lovely colors for it to stand out. 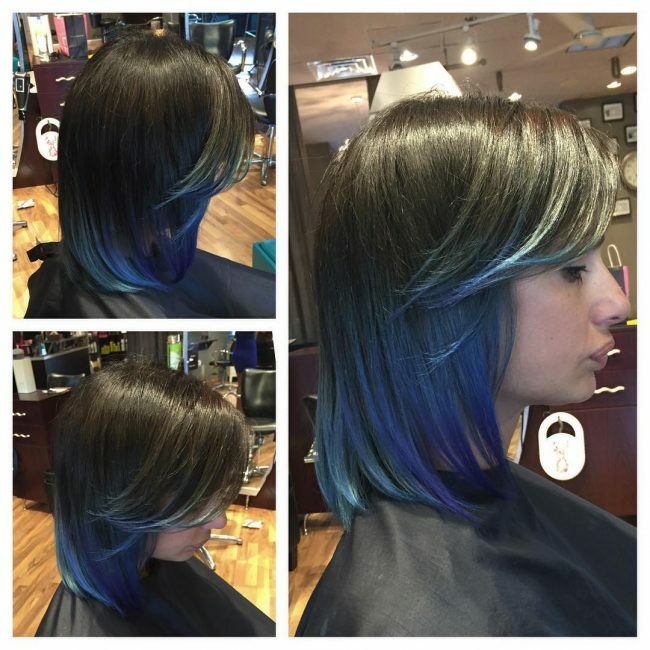 The black to blue ombre pattern is enough to create a fantastic tone. 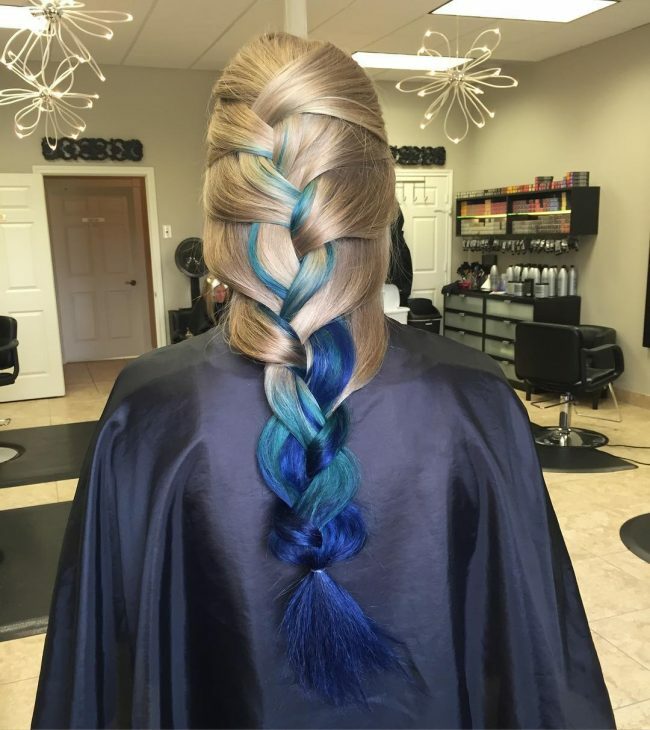 And so braiding such a flawlessly toned hair will not only help to tame your mane but also add some detail to your colors. 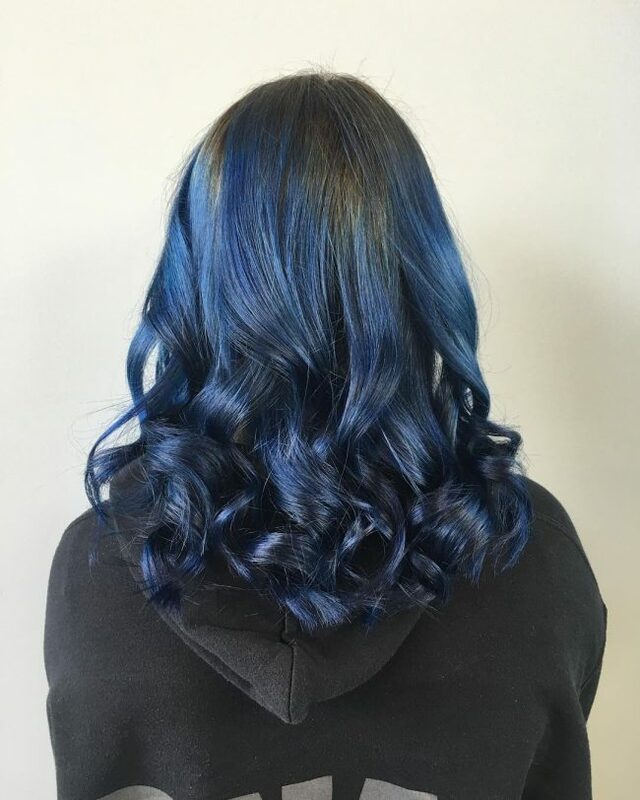 Midnight blue is a perfect shade for ladies who wish to repair or at least hide their bleached or damaged hair. In this particular style, it is beneath a natural black hair that is quite thin with a blow dry style. Although the shade does not create a perfect contrast, it helps to draw attention away from the thinness of the strands. With such an excellent volume and texture you cannot go wrong with any headdress. 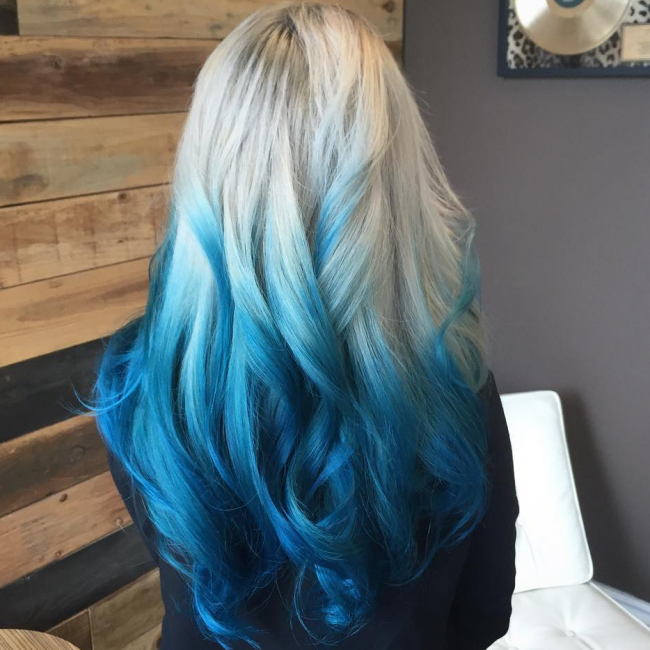 This perfection also makes things easier for you as you will only need to give it a beautiful color and the sea blue shade in an ombre pattern is ideal for this. This lovely shade makes the strands dazzle and also look very classy. To style your locks you should create a center part and then push them into a layered face frame design. 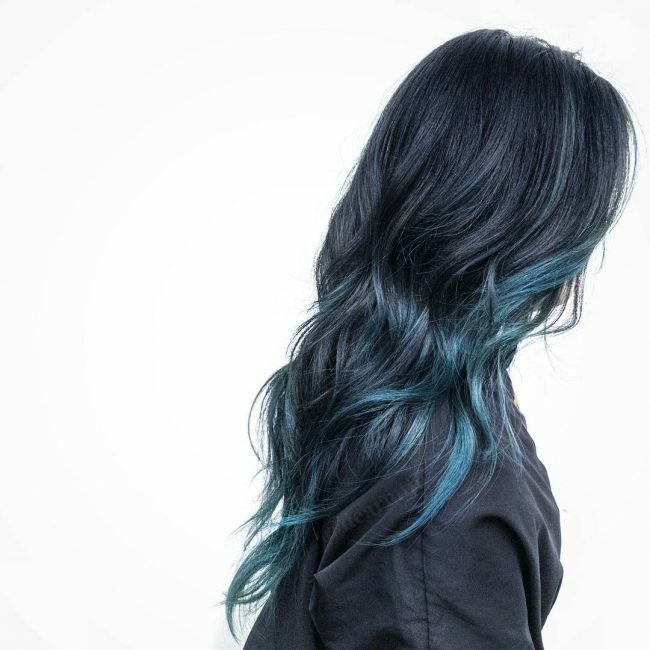 Dark brown and turquoise make a perfect mix, and if you use them well, then you can be sure of a refined dye job. In this design, the dark brown is the base shade, but it transitions to the turquoise to create a perfect contrast. These strands also have a subtle hint of blonde and to style them you should divide them into two parts and weave each into a neat Dutch braid. 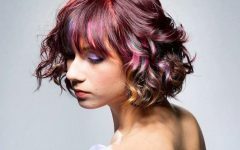 Ombre hairdos are not always about using a dark and bright shade because you can use any and as many colors as you wish. 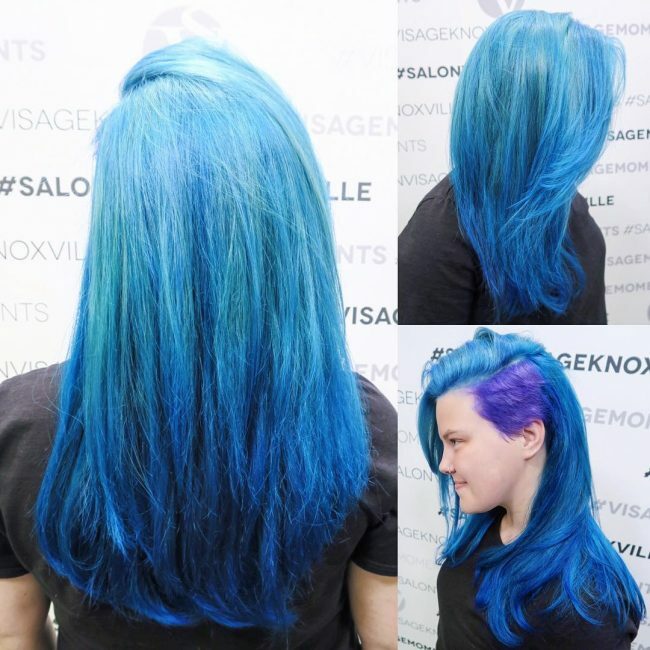 This style is a perfect example of this, and it starts with some pink roots before transitioning to a light blue shade and finishing with a bright purple hue. 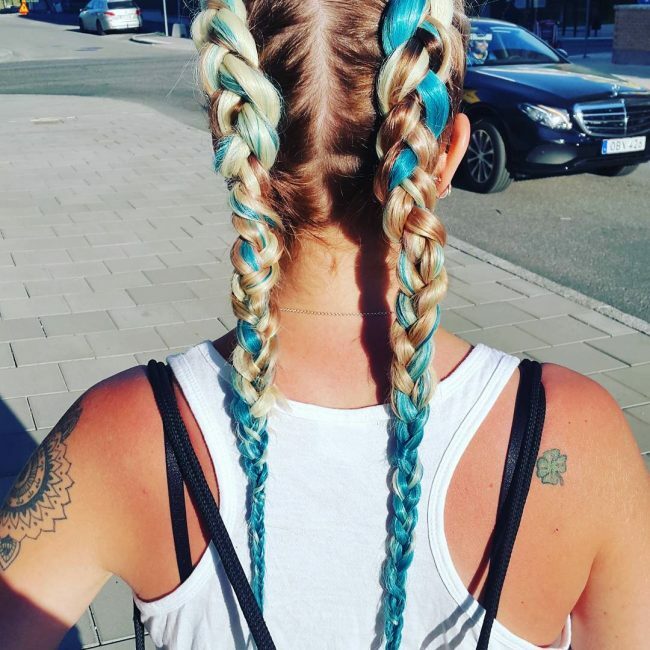 The strands are quite thin, but the bright pastels make this hard to notice and to style them you only need to push them back in a messy design. A dark toned look like this one will still make you look fantastic and stylish. It starts with a nice haircut to create a textured long bob. You should then give it an exotic blend of gray and deep blue to create the distinct shade. And for styling you should create a center part and brush your textured locks to the sides to create a face frame look that is layered slightly. Rose Brown is a vibrant shade that will make any woman look bright and trendy. And if you combine it with another gorgeous shade such as lavender then you can be sure of a headdress that will set you apart from others. In this design, the rose melts into a bright purple (lavender) hue to create a perfect ombre contrast. However, the long strands also have a perfect textured cut that spices up the look, and you should style by sweeping them back. Blonde is very fashionable, and it is one of the few shades that will never go out of trend. However, even with all its beauty you still need to spice it up with other shades to make your strands look distinct. In this particular style, the strands have pale blue streaks that spice them up to create an attractive tone. These locks also have some adorable natural waves, and so you do not need to do any further styling. 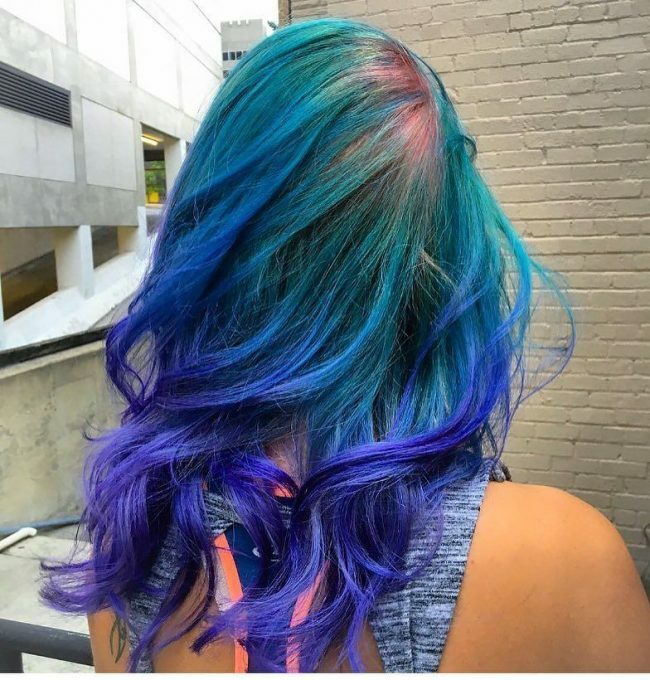 This mermaid hair has three distinct levels of color that start with a dark brown base shade before transitioning to purple and finishing with a blue hue on the tips. The color melt between these shades is amazing, and it is what makes this a top notch headdress. These locks also have some lovely waves and curly ends, and so a simple push back is enough to make them look stylish and adorable. Sometimes you should break away from the norm and tray a vintage hairdo like this one. Although in the past ladies did not use a lot of colors this one will still give you a retro look. 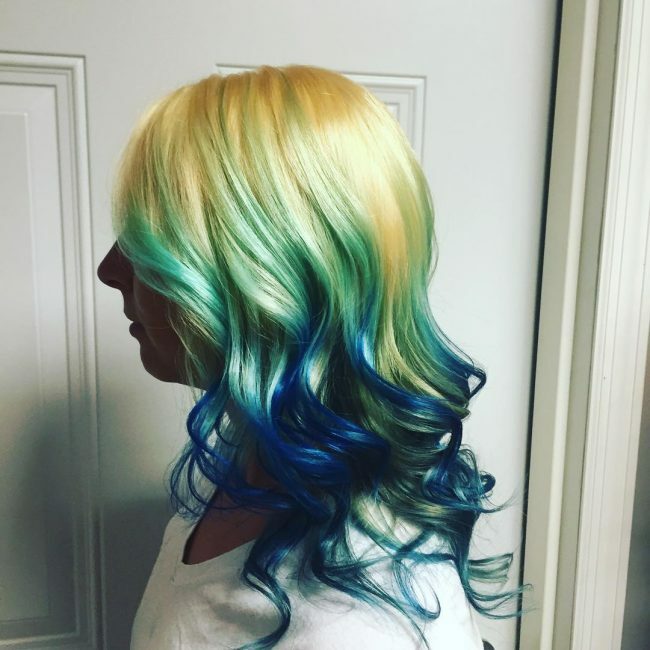 It involves transitioning from black to turquoise but there is still an in between yellow shade. And for styling, you will only need to give your long wavy strands a center part and brush them to the sides. Black is the most common hair color worldwide and just like brown it forms a perfect base hue. In this design, you only need to transition it drastically to a teal hue to create your lovely color pattern. 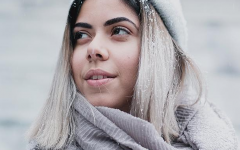 The long locks also have an excellent texture, and you should style by stacking them to create an extra volume and to add some detail to your shades. 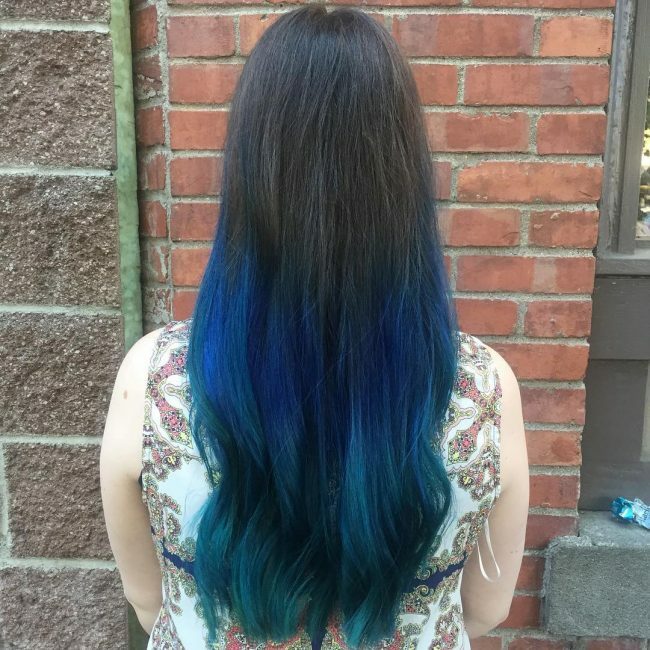 Cobalt blue and peacock green are unique shades that make a perfect combination. And so if you are looking for shades that you can use to create a distinct tone then they are an excellent choice. You should use them to make your natural black strands look intensive but if you want these colors to look good on you make sure that they are moderate. 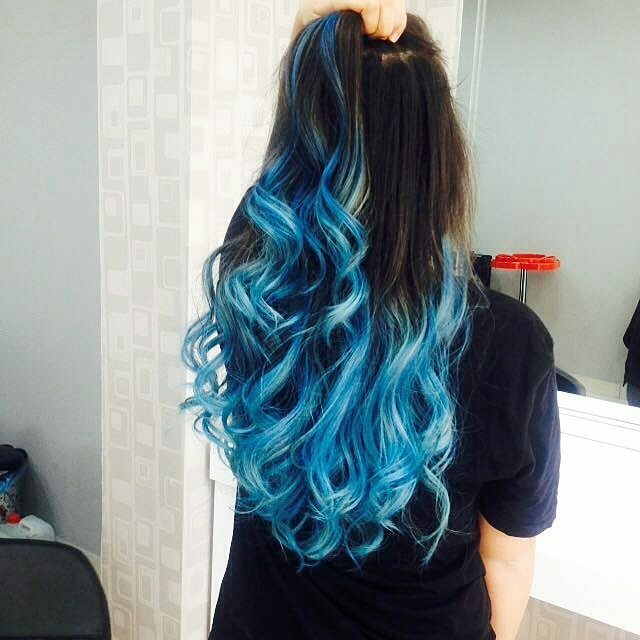 Blue ombre hair is a magical color pattern that will help transform your hair into something magnificent. And contrary to the widespread perception you do not have to go with bright hues to wear this look because you can still achieve it with dark ones. 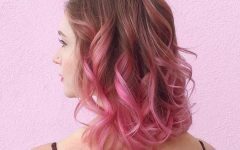 The 40 effortless hairstyles above will give you some ideas on how you can create a magnificent design with this lovely shade.